La Gente Newsmagazine - University of California, Los Angeles | Who Was Cesar Chávez? You are here: Home / Comunidad / Who Was Cesar Chávez? Header photo by John W. Schulze. Growing up in San Jose in northern California, I was surrounded by the Cesar Chávez Library, Cesar Chávez Elementary School, Plaza de Cesar Chávez, and the Cesar E. Chávez Community Action Center. Everywhere I went, there was either a street or a building named after Chávez. Although I did not know who Chávez was, I always enjoyed “Cesar Chávez Day,” because that meant we had no school on the day after my birthday. I assumed Cesar Chávez Day was recognized and honored everywhere, but I’ve recently come to learn that it is not a holiday celebrated in other states, or even other cities in California. 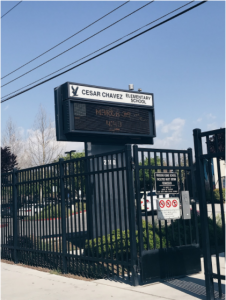 Cesar Chavez Elementary School in San Jose, California. Photo by Alondra Castanon. It was not until I took a Chicano Studies course at UCLA that I learned about his impact in the Chicanx community. As I head home for spring break, I would like to remember Cesar Chávez. Cesar Estrada Chávez was a Mexican American man born in Yuma, Arizona on March 31, 1927 (Cesar Chávez day is March 31). He married his high school sweetheart, Helen Fabela Chávez, and settled down in San Jose, California in 1939. The couple had a total of eight kids together, five daughters and three sons. In San Jose he became friends with Father Donald McDonnell who influenced him to learn and read about Ghandi and St. Francis. This ultimately influenced Chávez to become a firm believer in nonviolent acts of resistance such as marching, protesting, and hunger strikes. Chávez worked in the fields with his parents until the year 1952, until he became a part of the Community Service Organization. Some consider him to be the face of the Chicano Movement because of his committed activism for undocumented farm workers, the civil rights movement, and the progression and equality of the Latino community until the year of 1976. He founded the National Farm Workers Association along with Dolores Huerta in 1962. Chávez was an incredibly inspiring and hardworking man, it seems unjust that his history and activism is not implemented into curriculums in every school in the country, not just those of California. However, one can rest assured the field of Chicano Studies is giving Chávez the recognition he so rightfully deserves. 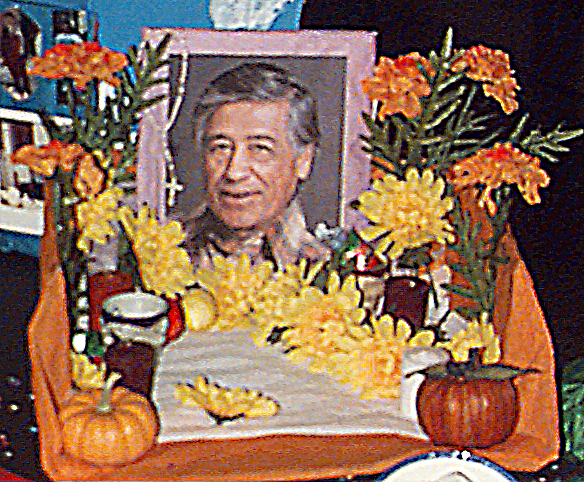 Cesar Chávez passed away on April 23, 1993 in San Luis, Arizona. He was buried in the National Chavez Center in California on April 29, 1993.